Ben Parzybok's debut novel Couch was my favorite surprise of the year. It had everything I could want in a book. Intrigue, action, adventure, believable characters, and a journey unparalleled by anything I've read in years. Parzybok is the mastermind behind such projects as Gumball Poetry, Walker Tracker, and the Black Magic Insurance Agency which runs city-wide treasure hunts. To say Ben has varied interests is an understatement. MH: Ben, thank you for taking time to answer my questions. I know you have quite a busy schedule coming with a writing sabbatical in South America, so I appreciate it. BP: Absolutely—it’s actually a trip for a wedding, with a writing sabbatical tacked onto the end. 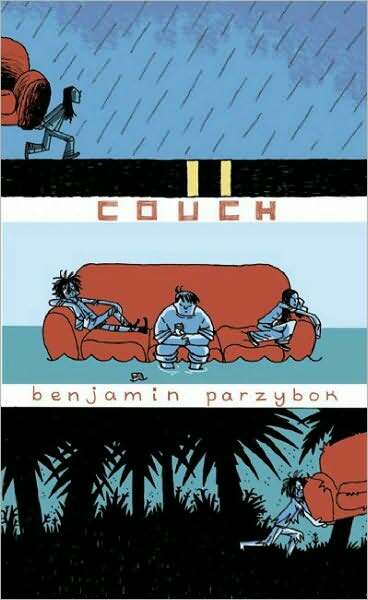 I like to write in foreign countries—all of Couch was written in Ecuador. MH: Couch is about the mundane activity of three guys moving a couch. What started you on the idea of twisting something that is usually so hated into a memorable adventure? BP: When I first moved to Portland, Oregon with my partner Laura Moulton we bought a couch at a second hand store about ten blocks from our house. Because we were too broke to rent a truck, we ambitiously decided to carry the couch the ten blocks back to our place. The route we had to carry it was right through the center of a trendy shopping district. We’d just moved to Portland from a year-long stay in Taiwan and we were just getting used to being Americans again. We wanted to fit in, but we were having a touch of reverse culture shock and in our neighborhood we felt like impostors. Carrying the couch completely changed that. I still can’t quite figure out how the magic worked, but where we were ignored before, people began to interact with us, joke with us, offer to help us. At corners—our arms already stretched to baboon-length by the weight—we’d set the couch down and, of course, sit on it. People would stop their cars in the street and ask if we were doing performance art. It was great. I began to think about how this could be a transformative experience for a few social outcasts and the book took off from there. MH: You’ve had quite the colored career doing everything from speech writing to publishing poetry in gumball machines and been responsible for organizing treasure hunts in various cities. How have your varied interests effected your writing and specifically to that of Couch? BP: Well, I suppose what my various interests have done is kept me from being prolific in writing. Though once I focus on a project, usually I do that exclusively. If there’s an identifiable thread between my various projects I’d sure like to know about it. MH: I found myself drawn to Thom the computer whiz from Couch because I’m a large guy who has often thought of himself as Tom does. Who from Couch is most like you? BP: All of the characters contain bits of me of course, but it’s true that I spent a lot more time in Thom. He has a lot of my same computer interests and while I’m not large like Thom is, I have felt a similar awkwardness in my skin. I liked spending time with Thom and still have an affinity for him. The book I’m writing now has a character with similarities. I often speak my characters—I’m a loud writer and vocalize the text, and while Erik was the most fun to vocalize, Thom I think is the closest to me. MH: Is there any story behind the character name Tree? Outside of the fact he seems pretty earthy. BP: I named him Tree because that’s how he felt to me—though sapling might be closer. The name came before there was much else to the book. I wanted him to be set aside from the others, a little strange. He has an innocence coupled with access to a deeper, mysterious well of knowledge, that he can sometimes make sense of and sometimes not. I think there’s other loose tie-ins to his own backstory and to the ending, but I don’t necessarily mean to press those. MH: Couch was the first book Small Beer Press published from their slush pile. What was it like the day you learned they wanted to publish it? Maybe they were trying to decide between publishing one of two titles, and the author who answers the phone first wins. I was given a tremendous amount of information in that first phone call, all of which I had to make them repeat later because all I could think was: Couch is getting published! MH: The cover for Couch is quite unusual. Is there a story behind its creation outside of the fact that the book is broken into three sections and so is the art? BP: The UK graphic novelist Andi Watson did the cover. We went through a couple of designs before arriving at that one. I’d always imagined a full-length cover of Tree on the couch in the ocean, looking back over his shoulder, but I was thrilled with the ideas that Andi came up with. MH: What music were you listening during the writing of Couch? You do make mention of Neutral Milk Hotel. I somehow picture you listening to Belle & Sebastian. BP: I did a playlist at Large Hearted Boy. I definitely need to be listening to music when I compose. I had a limited number of tracks on my laptop in Ecuador, and I listened to them over and over, basically. MH: You’ll be debuting a new story at the Hugo House shortly. Can you tell us about it and any new books that might be percolating? BP: Yes—the Hugo House piece was more of a performance—I’m not sure it would read that well as a straight story. The piece was about internet addiction and getting too close to the machine. There was a slideshow to go along with it, and live text-messaging on stage. I wrote some software for the gig. In the middle I asked the audience to perform a sort of captcha (those horrible boxes with distorted letters you have to fill out to sign up for an account pretty much everywhere online). They had to send me a text proving they were human, and then I displayed all the responses back to them on a giant screen as they came through. It was fun. I have a story coming out at Strange Horizons in a few months, which is also a bit of a departure. The book I’m working on now is about water and it’s not an adventure—but I’m not sure what else I can say about it at the moment. MH: Who are some under read authors/books you think we should check out? BP: I wish short story collections were more popular. Two I read recently are The Shell Collector by Anthony Doerr, Animal Crackers by Hannah Tinti, both of which were great. MH: Thanks for you time. I can't wait to see what you come up with next!